Microsoft is now preparing for the next major feature release of Windows 10, which will come as a free upgrade to the users already running Windows 10. 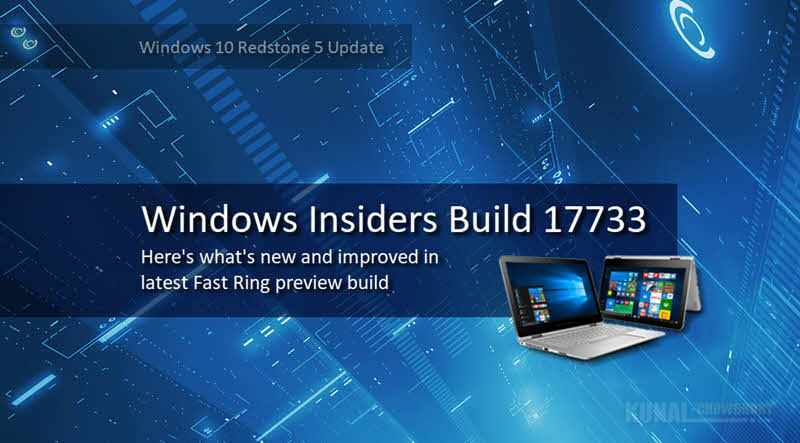 Stepping forward, Microsoft released a new preview build 17733 to the insiders in the fast ring. This build focuses a finished version of the dark theme for File Explorer and a bunch of improvements and fixes. Check out to see what's new, improved and still unfinished in this build. After months of hard work of the Windows Engineering team, finally came to an end. Microsoft announced that the File Explorer dark mode implementation is now finished and they have included the final bits of changes with the latest Windows 10 preview build 17733. As part of this build, Microsoft removed the XAML shadows for the moment while they are working on some of the things that insiders shared in past. The acrylic has been removed from some popup controls, but those will be back in a future flight. Fixed an issue from recent flights where the touch keyboard might become invisible on the screen. Fixed an issue where components of a notification with a progress bar might flash every time the progress bar updated. Fixed an issue where the Sound Settings page was unresponsive on certain devices if you reset your device and chose to keep files, after logging back into Windows. Fixed the issue where the High Contrast dropdown flashed when the values were changed. Fixed the issue where Narrator couldn't access all the emoji in the Touch Keyboard's emoji panel. Fixed the issue where Narrator didn't say "selected" after image was selected using the keyboard. Fixed the issue where Touch Narrator's focus remained on the word even after deselecting it. Fixed the issue where the Narrator key got sticky when using the Mouse Mode command. Fixed the issue where Narrator's Command Restore Default dialog was not read by Narrator. Fixed the issue where Narrator's copy and paste feature would say "selection removed" but the selection remained. Fixed the issue where Narrator automatic dialog read the Command key Assignment dialog twice. They have improved the Narrator experience when moving by character and announcing phonetic pronunciations. Fixed the issue where Narrator focus and keyboard focus got out of sync after navigating TreeView controls. Fixed the issue where Narrator misread the Calculator app's display on focus for values over 100. Fixed the issue where when launching Narrator QuickStart using the link in Narrator Settings, the Narrator icon would appear in the taskbar. Fixed the issue where Narrator couldn't read the label of the Word document recovery dialog. Fixed the issue so Narrator can now navigate the New Notepad Status Bar contents. Fixed the issue where Narrator Scan mode navigation didn't progress after tabbing onto a link. Fixed the issue where Narrator navigated out of the Microsoft Edge browser window using Scan mode on some web pages. Fixed the issue where Narrator crashed when Developer Mode was in use and the generated string to display was null. Fixed the issue where Narrator continuous reading got stuck on a table element in some HTML emails. Your PC will bug-check (GSOD) when deleting a local folder that is synced to OneDrive. Clicking a link to launch one app from another app may not work for some Insiders. We're investigating. On Windows 10 in S Mode, launching Office in the Store may fail to launch with an error about a .dll not being designed to run on Windows. The error message is that a .dll "is either not designed to run on Windows or it contains an error. Try installing the program again...". Some people have been able to work around this by uninstalling and reinstalling Office from the Store. Microsoft investigating a potential increase in Start reliability and performance issues in this build. After setting up a Windows Mixed Reality headset for the first time on this build with motion controllers, the controllers may need to be paired a second time before appearing in the headset. When using a Windows Mixed Reality immersive app, saying "Flashlight on" may fail to activate the flashlight feature even though the status appears as active on the Start menu. If you have come this far, it means that you liked what you are reading (Here's what's new, improved and still broken in latest Windows 10 preview build 17733 for Fast Ring (RS5)).